Kaleb Moore is originally from DeRidder, Louisiana and is currently enrolled at the University of Louisiana at Lafayette where he studies Political Science. 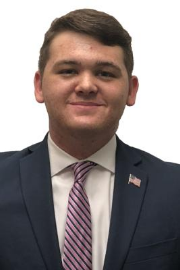 Kaleb is active on campus and currently serves as the Public Relations Officer for Pro-Life Cajuns, Campus Chair for Students for Liberty, and Chapter President for Young Americans for Liberty. Previously, he served as the Louisiana State Chair for Young Americans for Liberty. Kaleb is also the Vice President of Acadiana Young Republicans.